The Sustainable Angle showcased the Future Fabrics Expo for the first time at The London Textile Fair on the 18 & 19th July 2018 at the Business Design Centre in Islington, North London. The London Textile Fair invited the Future Fabrics Expo as part of its vision and commitment to help guide designers and brands on their journey towards more sustainable fabric sourcing and practices. 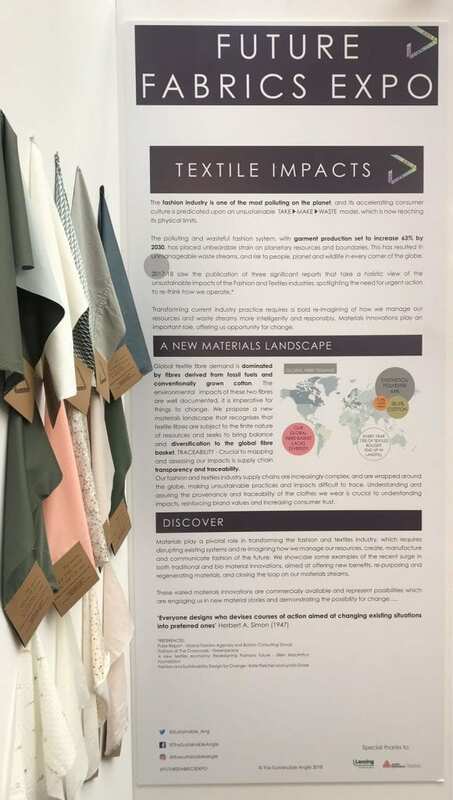 The Sustainable Angle presented a special edition of the Future Fabrics Expo, which showcased an information platform, enabling visitors at The London Textile Fair to access and discover a diverse range of commercially available sustainable textiles and material innovations for the future of fashion. This debut of a dedicated focus on sustainable fabrics at The London Textile Fair reflects a timely recognition of the critical imperative for the fashion and textile industries to practice sustainability throughout the fashion supply chain, starting with materials sourcing, at the very fibre and fabric stage. Within our Expo we featured two seminars each day, the first by The Sustainable Angle curator Amanda Johnston, highlighting current fashion and textile impacts. The critical need to think more intelligently about outdated models that pollute, waste precious resources and perpetrate the abuse of human rights and animal ethics were discussed. The seminar summarised the key sustainability issues of fibre and processing types, and introduced the Sustainable Angle’s perspective on materials sourcing. Oya Barlas Bingual from Lenzing Group introduced the company’s global firsts regarding fibre technology in low impact regenerated cellulosic’s, and the newly launched innovations that are providing viable alternatives to cotton and silk, whilst importantly paving the way towards closing the loop on our material streams. For example, LENZING™ ECOVERO™ viscose fibres are created from certified raw materials and controlled sources, and TENCEL™ Lyocell with REFIBRA™ technology involves up-cycling a proportion of pre- consumer cotton scraps. This special edition of the Future Fabrics Expo aimed to educate and inform visitors about the latest research and initiatives of global textile organisations, who are making positive contributions to the design, manufacture, and functionality of more sustainable practices, creating and extending sustainable networks in the fashion and textile industries. We supported this by presenting a broad range of fabrics, materials and key information that contributes to increasing knowledge and providing solutions from a sourcing perspective. Thank you to The London Textiles Fair team for hosting us, and for the overwhelmingly positive feedback from all our visitors!